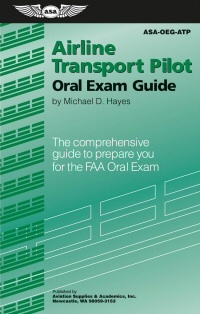 Written to help prepare applicants for their oral exams with FAA examiners. Using a question-and-answer format, each Oral Exam Guide lists the questions most likely to be asked by examiners and provides succinct, ready responses. Pilots will find these Guides indispensable tools in both planning for what to expect during the airplane checkride, and mastering the subject matter. Instructors rate them as excellent preparation for students, as well as preps for Instrument Proficiency Checks (IPCs), aircraft transitions, and as general refresher material. All the subjects an ATP candidate will be tested on during checkrides, career interviews, and aircraft transition rides are covered. Chapters are dedicated to turbine aircraft theory, performance and limitations, airline operational procedures, aeronautical decision making (ADM) and crew resource management (CRM), regulations, and instrument procedures. This guide concludes with 2 appendices that contain questions and answers candidates can expect on an airline-type ride, concerning aircraft systems and limitations. All the information in these appendices is specific to the Beechcraft 1900C aircraft, so pilots can learn the basic components and principles for the type of turboprop aircraft found in many of today’s regional airline fleets. This section may also be used as a workbook, with space provided so readers can reference their airplane operating manual to fill in the blanks to the same questions asked about the BE1900C. Answers and explanations were researched using FAA documents (and are identified so readers know where to go for further study on any given question) as well as interviewing a variety of airline pilots, 121/135 operators, and examiners. The ATP Oral Exam Guide teaches applicants not only what to expect, but also how to exhibit subject mastery and confidence when they’re under the examiner’s scrutiny. It identifies the candidates' strengths, weaknesses, and gaps in their aeronautical knowledge, which increases study efficiency. Soft cover, 192 pages (First Edition 2002). ASA: Dictionary of Aeronautical Terms, 5th Edit.